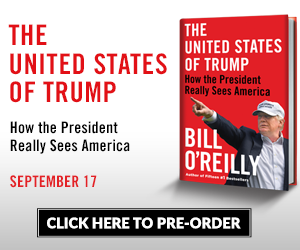 Bill O'Reilly: BillOReilly.com Column - Whither Patriotism? You've probably heard about the new poll conducted by the Pew Research Center. One notable and unfortunate finding: Only 28% of Americans believe this nation "stands above all other countries." That's down ten points from just three years ago, when 38% considered this the greatest country in the world. Even Republicans, usually stalwart defenders of American exceptionalism, are somewhat down on this country. Perhaps even more troubling is the number 44%. More than four in ten of the folks don't "often feel proud to be American." Who knows, maybe that's even lower after our World Cup loss to Belgium. Our perspicacious pal Charles Krauthammer places some of the blame on President Obama's early focus on America's ills. Not to be outdone, Republican Kate Obenshain claims, "We have a president who has been insisting that things are our fault." No doubt President Obama has not been America's most enthusiastic cheerleader, but the trend runs far deeper than just one person. The very notion of American exceptionalism is routinely mocked by the eggheads in Harvard Yard and the swells in Hollywood. For nearly a half-century, America's coastal elites have taken great pains to focus on this nation's shortcomings, of which there are many. These are the same people who create our popular entertainment and dominate our universities. As a result, many of our children grow up steeped in a toxic brew of negativity, ridicule, and downright anti-Americanism. They've learned, courtesy of "intellectuals" like Noam Chomsky and Howard Zinn, that the USA is an imperialistic and racist power. Of course, anyone reading this already knows the other side of the argument. Is there a legacy of racism in America? Yes, but what other nation has done more to correct that? Which other country has been as welcoming to people from around the world? Have we undertaken ill-advised military adventures? Without doubt, but who else liberated tens of millions from fascism, death camps, and communism? As one general noted, America doesn't demand territory or spoils after a military victory, only enough ground to bury our dead. So on this July 4th weekend, we might take a moment to contemplate what began 238 years ago. The founding of America ushered in an explosion of freedom, creativity, and inventiveness. Jefferson, Adams, and even wise old Ben Franklin would be totally flummoxed by the America of today, with people talking into strange devices, watching glowing screens, traveling on metal behemoths in the sky. Would these wonders have happened without America? It's possible, but doubtful. But while the exceptionalism of America is obvious to all but the willfully blind, the downward trend of USA pride may continue for a while. The generation that came of age in the 60s, and its members who mock flag-waving and patriotism, will be dominant for a while. Perhaps a new generation will eventually come along with a more generous assessment of this remarkable nation. Their teachers might counter the negativity of Zinn and Chomsky with some observations from Toqueville and, yes, Krauthammer. The American Revolution was the spark that ignited an incredible and ongoing experiment. Whatever its flaws, America has been a force for good, a noble country inhabited by mostly noble people. The nay-sayers have some momentum, but the truth about America will win out in the end. Because this is indeed an exceptional country. A country that remains, as Lincoln put it, "the last best hope of earth."